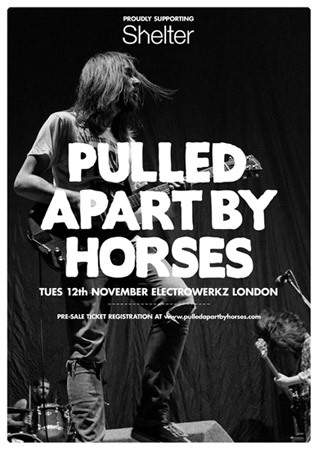 Calling all Pulled Apart by Horses’ fans: super special intimate gig. Sadly if you’re reading this now then you have missed out on your chance for a ticket to this special intimate gig. The gig will see the band preview their new material at London’s Electrowerkz on November 12. The tickets went on sale through the band’s website on Wednesday morning last week and sold out in only a couple of hours. Sorry to rub it in. However, you can take some solace in the fact that the show is helping to raise money for a very worthy cause; the housing charity Shelter. The boys have confirmed that this will be their final live show of 2013. Known for their intense, frantic live shows (guitarist James Brown once ended up in hospital with a gash to the head) the Leeds four piece are a real force of nature when viewed in an environment such as this. Pulled Apart by Horses are due to go back in the studio and start work on their third album, the follow up to 2012’s well received, Tough Love. Rumoured to be titled Papa Lulus 101 Fish Bowl Prank the record will continue the band’s relationship with Transgressive Records and is expected to be released in early 2014.